This paper examines the structure of the formal and informal sectors in Albania. 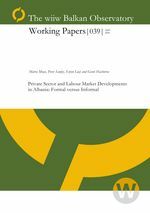 The paper outlines the size and development of the formal private sector in Albania, and assesses the obstacles faced by businesses, especially in the SME sector, and how these have changed in recent years. Although the business climate appears to have improved since 1999, Albanian enterprises still face a variety of difficulties, which act as an inducement to operate in the informal sector instead. We attempt to estimate the size of the informal sector, using a variety of methods. None of them provides a very reliable method of estimation, but the results confirm previous work that shows that the informal sector accounts for between 30 and 60 per cent of official GDP. We also show that there is a significant gap between registered unemployment and the number of unemployed based on labour force surveys. Part of this gap is due to large-scale emigration flows.